The discussion I see going on about NFL players and others kneeling during the anthem frames it as a two-sided issue. On the one hand, there’s me and everyone I know: people who believe in free speech and peaceful protest and the worth of Black lives. The other side is our president and others who find it unacceptable for anyone to kneel while listening to the Star Spangled Banner. But on one occasion last year I saw a third side: Nice White* Ladies who value Black lives, support Kaepernick and his protest, believe in social justice, and nonetheless suppressed anthem-kneeling when it was in their power to do so. How does this happen? How do well-intentioned groups of liberals manage to suppress protest and perpetuate racism without ever feeling racist? I’m posting this for you, Nice White Ladies. For us. So we can better understand the mechanisms by which we cause harm without meaning to, in hopes that understanding might help us to stop. I’m a singer. Not an athlete, or even a sports fan, just a Nice White Lady who had an amazing high school choral director who inspired in me a lifelong love of harmony. I auditioned for and joined an excellent small women’s chorus whose biggest annual fundraiser is singing the national anthem at a baseball game. We buy a big block of tickets to the game and sell them to our friends at a profit. The first time this happened while I was a member of the group, in the fall of 2016, I had a scheduling conflict. Kaepernick’s protest was happening, but I was off the hook for figuring out what I was going to do about it. The second time, last spring, I was available. I wasn’t comfortable with singing the Star Spangled Banner at a national sporting event without supporting Black Lives Matter or acknowledging Kaepernick’s lingering unemployment, but I wasn’t sure what I should do. 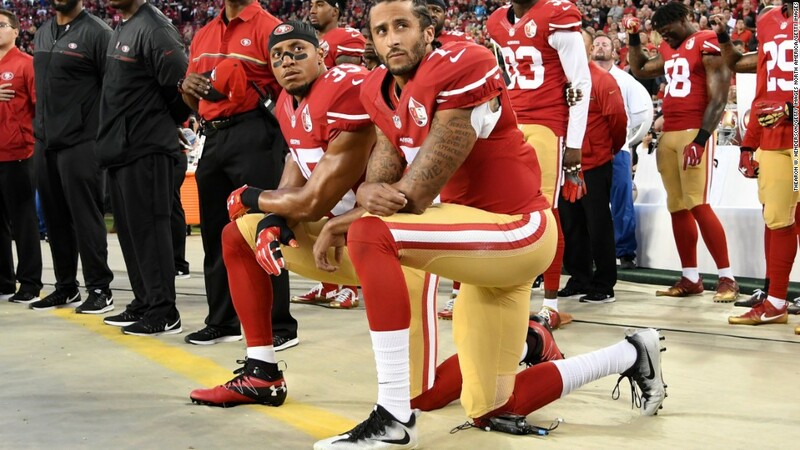 While I was mulling it over, my Black girlfriend suggested the obvious: “You could take a knee.” I was scared to do that, but it was clearly the right thing to do, so I resolved to sing and kneel. I was a bit sick that day and I was afraid that if I just knelt while we were singing the women I sing with might think I was physically unwell. I didn’t want them to worry, so I emailed the group: “I’ve thought a lot about it, and for important reasons I’m planning to take a knee while we sing today. Just letting you all know so that when it happens you know I’m ok.” I linked to some articles about Kaepernick’s protest. Then, about an hour after I sent the email, I got a call from our director. She said several unnamed members of the group were uncomfortable with me kneeling and she asked me not to do it. She also let me know that I wasn’t the first to want to do this. On a previous occasion the only Black member of our group had had a similar plan to kneel while singing, and was similarly asked not to. The director also let me know that my participation wasn’t mandatory, and that if I wasn’t comfortable standing and singing with the group I was welcome to choose to stay home. I said that I heard her, but that I was resolved in my decision to kneel and sing. I then had a few hours before the group met up to decide how far I was willing to take this. If she really didn’t want me to do it, what would it take? Would someone need to forcibly remove me from the field? Would I leave if someone started yelling at me? Would I honor the result of a group vote on the matter? I’m still not clear that I made the right decision in those hours, but I decided that as long as it was up to me I’d sing and kneel, but that it was the prerogative of the director to kick me out of the group if that’s what she decided to do. So I went to the game, warmed up with the group, participated in a Very Interesting Discussion with the group about my decision to kneel, did a sound check with the group on the field, and then the director pulled me aside and asked me to leave. I went home, they sang, and the game was played. I’ve been thinking a lot about everything that happened last Wednesday when I ultimately didn’t sing the national anthem with you all. It’s been difficult; I was adrenalized and not eating or sleeping very well for a few days around it, and I know I’m not the only one of us navigating the situation with some anxiety. My many uncertainties about all of my own decisions in this process are still very present for me. I care about this group a lot. And also it’s hard to reflect on the racial implications of what I did and what I could have done and what I should have done without falling into the spiral of guilt and self-judgement that comes of seeing racism as the individual actions of bad people. We are a small group of mostly white women who as far as I know each support Black Lives Matter and yet, despite our good intentions, I saw us work together very effectively last week to do our small part in maintaining a racist status quo. I’m sure not every one of you agrees that we were maintaining a racist anything, and I don’t think any of us think that this is an easy conversation. The only way I’ve ever seen conversations like this move forward is when we are willing to breathe through our inevitable defensiveness and allow space for everyone, including ourselves, to grow and learn. That’s hard enough to do that I don’t have any reason to believe our process will be easy or pretty, but I think we can try. I deeply appreciate how throughout this process I’ve seen each of us consistently working toward integrity, aligning our behaviors with our most deeply held beliefs. It’s a stumbly process for sure, but that’s how these things go, and we do have the marked advantage of already being a cohesive group that relies on each other and works together to learn. So, let’s stumble forward together on this one, shall we? The piece of this process that I find most interesting is the how of it. In the conversations on the day of the game, I saw some things playing out that felt familiar; they were mechanisms I’d read about. I read the internet a lot, specifically articles written by brilliant anti-racist activists about how well-intentioned white women like me inadvertently stand in the way of progresson racial justice and what we can do instead to be part of the change we hope to see. I’ve seen and heard members of this group express a strong commitment to racial justice; I feel sure we have many common goals around these issues. I guess my hope in writing all this out is to untangle and make visible some of the mechanisms I saw playing out within the group so we can start to see them for what they are and have more choice about how to do things in the future, both here and in other spaces we’re each a part of. But then came the “but.” “Individually I agree with you, but think of the needs of the group.” The argument that was ultimately given as the reason I wouldn’t be allowed to sing with you last Wednesday was that my individual action would reflect on the group, and for that reason the group had the right to decide whether or not I could do it. The risk to the group of me kneeling while we sang was that we might not be invited back. No one thought that was terribly likely, but it was a possibility. (I don’t recall any discussion of the benefits to the group of me kneeling while we sang.) The cost of not being invited back, it was explained to me, was that without this fundraiser we’d have to find another way to raise money. The way we used to raise money before was a lot more work for everyone. This was the first thing that struck me: we were, quite literally, a group of mostly white women deciding to shut down an anti-racist action because it might limit the convenience with which we could get money. Now, the stakes all around were fairly low, as these things go. This small protest wasn’t likely going to have enormous repercussions in any direction, and it certainly wouldn’t have ended racism. But still, the prioritizing of white people’s money over Black people’s lives in the U.S. has a long history that is by no means over. Shutting down an anti-racist action because it might make it harder for us to get money felt to me like part of that history. There’s also the question of whether my decision to kneel should even be subject to group approval. When I thought through my decision in the first place (which was a whole process on my end) I brainstormed rather thoroughly all the potential consequences of the actions I might choose to take, and I knew that it was possible that my individual action could have consequences for the group. I thought a lot about the ethics of autonomous action. Clearly, there are many differences between this small women’s chorus and the group consisting of all white people, and, much as I wish it could, kneeling will not end white supremacy. Still, those were the needs I was weighing, on the one hand the rights of the group to have a say in actions that might have repercussions for the group, and on the other hand the necessity of stepping forward, disobediently if necessary, to stand in solidarity with people still trying to get free after 400 years of oppression. Another objection I heard was that I didn’t bring it up soon enough; that I should have brought it up sooner so we could all talk about it. But we don’t get together to talk politics, we get together to sing. I didn’t want to force a whole conversation on anyone who didn’t want to have it, and I didn’t want to kill it in committee. I was just going to do my thing and let it be. But then I also learned that I wasn’t the first singer in this group in this situation, which made it a little hard to believe that bringing it up sooner would even have helped. If there had been a will to have this conversation, we certainly could have found a time in the months since the last time it came up. In practice, objections to timing are often resolved by indefinite delay. In that way, though the intent is very different, the impact is that we just don’t have the conversation at all, and avoiding these issues certainly supports the status quo. I also heard some things along the lines of “but this event is supposed to be fun.” I get that people brought their families and friends and kids and colleagues, and that one of the more likely consequences of me kneeling is that people might wind up having conversations about race and protest and sports and police violence when they would rather set those things aside and have conversations about baseball or whatever else people would like to talk about at baseball games. I feel pretty strongly that that’s not a sufficient reason. People of color suffering from police violence and other facets of racism don’t get choice when that happens, in fact it happens to them continuously, in ways big and small. They don’t get to avoid thinking about it, and I’m not invested in protecting people who aren’t faced with racism on a daily basis from having to think about the lived experiences of people who are. Writing the rules of the game is perhaps the best mechanism I know to rig a system. On Wednesday, I heard people say that if I was going to go sing and kneel that was a significant change that the group would need to have unanimous or near-unanimous agreement on. Yet, no one suggested that if we were going to ask a singer to go home and not sing with us, that too would be a significant change that the group would need to have unanimous or near-unanimous agreement on. In other words, unanimity was only enforced when it helped maintain the status quo, that no one would take a knee to publicly protest racism. The people who voiced support for me kneeling while singing outnumbered the people who voiced support for asking me to go home rather than kneel. But, they talked less, and later, and some stayed quiet altogether. It’s hard to speak truth to power, even and perhaps especially when “power” is wonderful, kind people you like and respect. But people who disagree with what’s happening staying quiet about that is how the status quo gets perpetuated. Social pressure to go along with what’s happening is big, actually, and speaking up in opposition is hard. After the fact, the whole issue got reframed as something that wasn’t about protest or race at all. Three (awesome, amazing, wonderful) leaders in the group wrote an addendum to the handbook addressing exactly what our policy is when a singer isn’t cool with a particular gig. What feels upsetting to me about that isn’t that we’re making policies, it’s the derailment factor. We’re making a policy about a general phenomenon which doesn’t exist outside of one particular instance instead of addressing the particulars of the thing that happened. This kind of derailment is a super common mechanism by which difficult discussions get avoided; we just reframed the whole discussion to be about something much less loaded than race. I imagine it’s hard to read a whole list like the one above and then believe me when I say this, but I’m not angry. I know and feel deeply how much each of us cares about being good people and is actively working towards that end. There’s also lots of stuff that happened in those conversations that I deeply appreciated and that isn’t reflected in this list at all. I know we’re all doing our best. I just also know that when people get together and all do our best we still sometimes wind up having an impact we don’t intend, and so I want to understand the mechanisms of how that happens so we can make our best better. I want us all to take opportunities to lean into hard conversations and learn from each other how to better align our impact with our intent. I’m reflective. I don’t know how this email will be received and so it feels a bit scary to send, but there comes a time to stop writing and start sending. If you’ve gotten this far, you’ve read a lot; thanks so much for listening. (If you want more you can always start clicking links.) If anyone wants to talk with me about any of this, I’m open to that and committed to working to be open-hearted in that conversation. And if anyone actively doesn’t want to talk with me about it, I respect that too, genuinely. Please know that I am writing and sending with a lot of love and respect for each of you wonderful humans, and also that I trust that whatever comes of this we can and will work through it together. I hit send, and went to bed. I’d been working on the email for days, and I was tired. I didn’t know what would come of it, but the group had an all-day retreat coming up that weekend, so I imagined we’d discuss it then. The only reply I got was an expression of gratitude from a woman who wouldn’t be at the retreat. At the retreat, the morning came and went. We sang. Over lunch, everyone sat around chatting about random things. I had a lovely conversation with the one Black woman about navigating the whiteness of classical choral music-making spaces. She said she appreciated my email. The afternoon came and went. We sang. Then we left. Then we finished out the season. My email was not otherwise acknowledged, and no one ever talked to me about any of it again. I have a lot of uncertainty about what I should have done. I regret telling the group that I was planning to kneel. I didn’t intend to ask permission, and I suspect that if I’d kept my plan a secret I could’ve just kneeled and the people who didn’t like it may not have bothered to tell me so after the fact. I’m ashamed to admit that I’m a little bit relieved I didn’t wind up kneeling politically in front of thousands of people. I was anxious about it. Resolved, but super scared, and ultimately I didn’t do it. I’m no longer singing with that group. There are other reasons for that, but I wonder to what extent stepping away was a lazy way out of dealing with situations like this, and to what extent it was a great way to deal with situations like this. It’s certainly easier for me to step away than to try to push the group. I do miss singing with them though. They sing real pretty. *Not all of the ladies in the group are white, but we had enough whiteness among us that I think it’s a fair overall characterization. The one Black woman wasn’t there on anthem-singing day. I found this piece to be so thoughtful, so clear, with eyes on both forest and trees, so deeply nuanced, and so important for us NWLs to take in. this was such a thorough thought process. This really helped me focus on so much of our lives that makes it easy for us to step away…I dont’ want to step away anymore…I always say I want to be a change maker…now is the time. Wow. Thank you for sharing. This struck me deeply. I am politically active and want to feel like I fight racism every day. But being a NWL, I realize I have the luxury to pick up and put down the fight at my convenience. To be effective, we need to stand strong on this issue every day and on every issue, not just when it is “appropriate”. Fighting racism is never going to be popular. It will always make some group uncomfortable. The status quo won’t end as long as we stay comfortable.